Explanation: For much of the month of October, traveling shock waves from the Sun and solar wind gusts have buffeted planet Earth's magnetosphere. 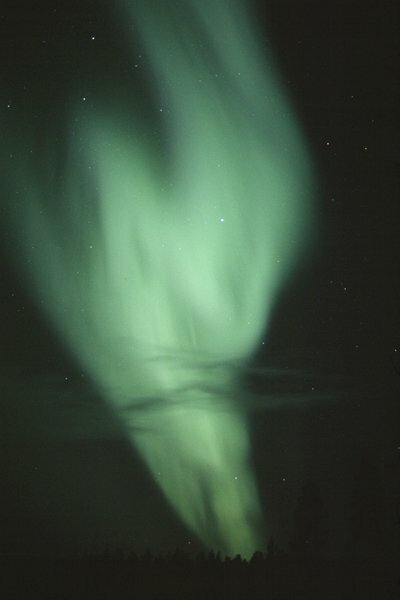 As a result, skywatchers at high latitudes in the northern hemisphere were treated to many displays of the aurora borealis or northern lights. For example, on the first of October this particularly ghostly apparition was photographed looming above the horizon near the town of Inari in northern Finnish Lapland. But the solar wind is dying down for now. So if you just happen to be out tonight and you see such a specter haunting your skies ... it may not be an aurora. Have a safe and happy Halloween!